Trek, bike, raft & more! Flight to the Galapagos included! Explore volcanoes, jungles, rivers, and islands on the mainland & Galapagos – this is the most iconic Ecuador adventure you could dream of. Start your 11-day adventure in Ecuador’s beautiful capital, Quito, deemed a World Heritage site by UNESCO. 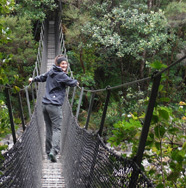 Trek through Cotopaxi Volcano National Park and bike through Llanganates National Park in a stunning landscape of volcanoes, rivers, jungles, and forests. Descend to the unparalleled wonder of the Amazon rainforest to hike and paddle through the rushing whitewater of the Jatunyacu River. Leave the mainland and explore the unique flora and fauna of the Galapagos Islands. Hike to the top of the Sierra Negra Volcano, which boasts the world's second biggest crater, and explore island coves to discover colorful schools of fish, turtles, sea lions, and penguins. 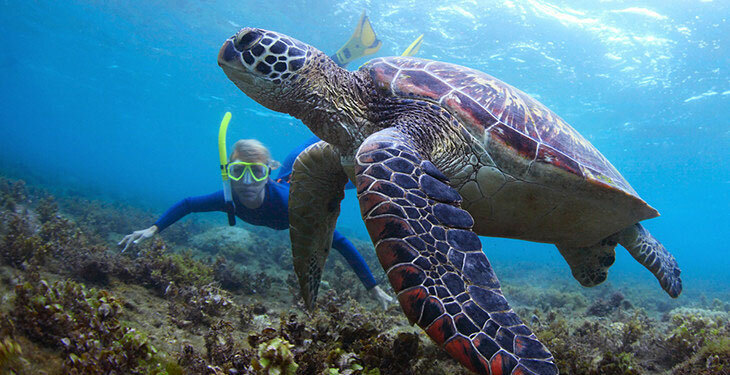 Hike, snorkel, and swim in hidden corners of the Galapagos under the leadership of a professional guide and naturalist, as you explore this living museum of evolutionary changes. Don't miss this opportunity to have the experience of a lifetime while discovering the incredible diversity of planet Earth. Depending on when your flight arrives, you can spend some time today exploring Quito, Ecuador's capital and a UNESCO World Heritage Site. Located in the middle of the Andes and considered the cultural capital of South America, there are endless opportunities for day trips, including visiting the market in Otavalo, the Papallacta Hot Springs, and more. 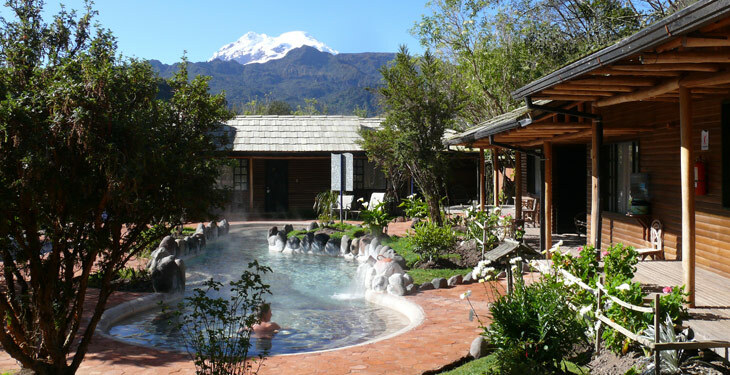 After breakfast, take a drive through the Andes, enjoying magnificent views of the Avenue of Volcanoes. Once you reach Cotopaxi National Park, start hiking in the highlands around Limpiopungo Lake, located at 13,000 feet (3,800 m) above sea level. Along the trail, you may see wild horses, wild bulls, and local bird species. From here you can enjoy a spectacular view of Cotopaxi, a snow-capped volcano that last erupted in the 1940's. In the afternoon, you'll transfer to Baños, located at the gateway to the Amazon. In the evening, enjoy the best nightlife, cocktails, and Salsa dancing. 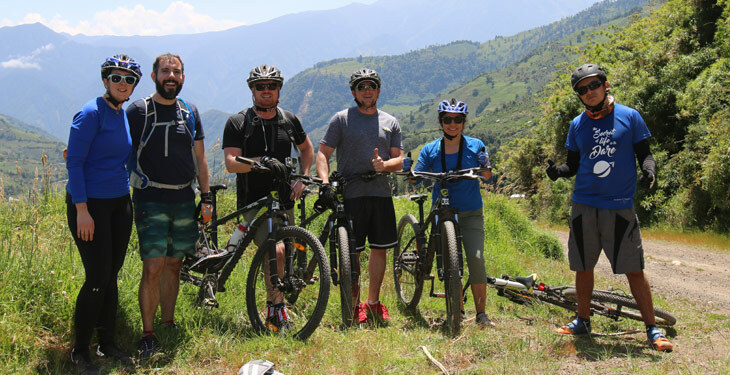 Today you'll mountain bike from Llanganates National Park down to the Pastaza River Canyon, enjoying the beautiful scenery of the cloud forest. The road brings you through some Andean farms and a beautiful canyon with many waterfalls. While descending into the jungle, enjoy breathtaking views of Baños, known for its spectacular location right on the foothills of the 16,000-foot volcano Tungurahua. In the afternoon you can take some time to explore the town and nightlife. This morning's journey takes you to the famous Road of Waterfalls. The first stop will be at the Bride's Veil waterfall, where you'll take the tarabita (cable car) to get across the Pastaza River. Afterwards, you'll hike down to the Pailon del Diablo ("Devil's Cauldron") waterfall, the second highest in Ecuador, before going deeper into the jungle inside Llanganates National Park. During the 3-hour hike through the canyon you'll learn about the flora and fauna of the tropical rainforest. Take the opportunity to climb some small waterfalls and then return to the lodge. After a quick rest in the hammocks, you'll prepare your own chocolate for an authentic local snack. Start the day off by learning about the ancient art of blowgun hunting. Afterward you'll begin today's rafting trip, taking a short drive to the Jatunyacu River where your guides will give a safety briefing before launching into the rapids. As you raft down the river you'll take in amazing views of the jungle, enjoy the rapids, play some games, and see the local people fishing and panning for gold. At the end of the rafting expedition, you'll stop for a picnic before driving back to the high Andes. On the way, you'll take a pit stop at the Guango Hummingbird reserve where you can enjoy a coffee or hot chocolate while admiring and capturing some pictures of these unique and beautiful birds. The rest of the day is yours to enjoy the volcanic hot springs. This morning you'll head to the airport for a 3-hour flight to the Galapagos Islands. Once on the islands, you'll transfer to Puerto Ayora, the capital of Santa Cruz Island. After that, take a 2-hour speedboat ride out to Isabela Island, the biggest and most beautiful island in the archipelago. 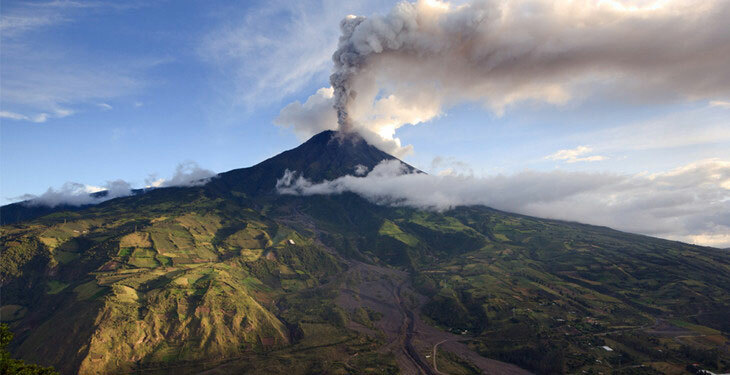 Early in the morning, after breakfast, the group will take an excursion to the Sierra Negra Volcano. This volcano is located 13 miles from Port Villamil and has the second largest volcanic crater in the world, measuring 6 miles in diameter and 300 feet deep. The journey begins as you travel by bus or similar vehicle for 45 minutes to Galapagos National Park, then start the 3-hour hike up the Sierra Negra Volcano. You'll make your way to the Volcan Chico ("Small Volcano") where you can feel the warmth of the ground underfoot as evidence of the volcano’s continuing activity. Break for lunch before returning to the hotel. In the afternoon, visit Tintoreras, the local name for the White Tip Shark, and a set of small, rocky islets tucked in Isabela Bay. Tintoreras’ islets are filled with endemic wildlife. With some luck, you may see the Galapagos Penguin, sharks, sea turtles, sea lions and many more species as you explore the small coves and beaches of Tintoreras. Today's adventure takes you to the lava tunnels of Isabela Island. These fascinating tunnels are located 45 minutes from Puerto Villamil by boat, and are one of the most impressive spots around the islands. Located in the western part of Isabela, the tunnels are a result of lava forming arcs in the ocean. This spot is a great place to view huge manta rays, turtles, sharks, penguins, blue-footed boobies, and seahorses. The tour consists of a short stroll over the lava formations followed by an eye-opening underwater experience, with myriad sea life to be discovered. After the tour you'll have free time to relax or join one of the optional tours, such as biking to the Wall of Tears or kayaking in Tintoreras (optional tours are an additional cost). In the morning, embark on a fast boat from Isabela to Santa Cruz Island. During the island crossing, be on the lookout for dolphins, as well as whales should you visit between July to October. Once you arrive, you'll check in at the hotel. Enjoy a visit to the Charles Darwin Research Station to learn more about many of the endemic species you met during your adventure, as well as the ongoing conservation and management efforts on the Galapagos Islands. In the afternoon, head to El Chato Reserve in the highlands of Santa Cruz, home to the famous Galapagos tortoise. Hiking through El Chato's beautiful scenery with those lumbering giants is an unforgettable experience! You'll likely see other highland wildlife such as pintail ducks, egrets, flycatchers, and finches on the hike. You can also observe the frigate birds which gather to wash the salt off their feathers at a nearby freshwater lake. Enjoy your final breakfast in the Galapagos Islands and take some time to capture a few more pictures of the sea lions and other wildlife. Today you'll transfer to Baltra Island for your flight back to the mainland. The tour concludes today as you return home. Your guides at Adventure Journeys wish you a safe return and look forward to your next visit. 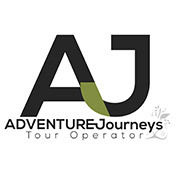 Adventure Journeys reserves the right to operate the tour in reverse order (first Galapagos and then Ecuador) due to logistics and availability. All the activities mentioned will be included. All Adventure Journeys guides and trip leaders are highly experienced, licensed from the Tourism University to operate in Ecuador, and certified as Wilderness Adventure First Aid responders. 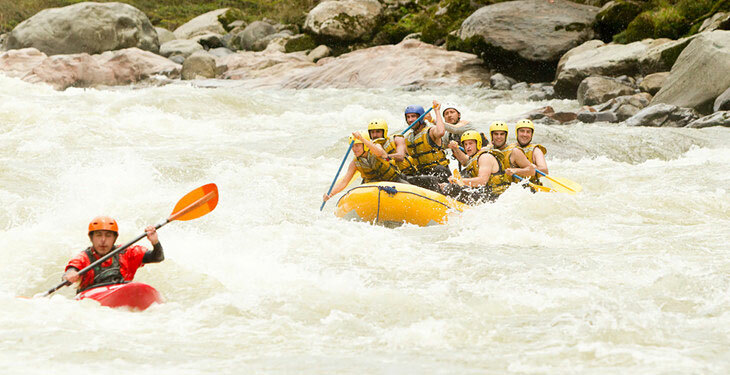 Additionally, they have all completed several extra training courses for kayaking, rafting, biking and horse riding. And to top it off, they are all Ecuadorian and have amazing personalities. In some locations and for some activities, local guides join the trip leaders, practicing sustainable tourism by involving the local indigenous people in the tour operations. Adventure Journeys aims to promote the long-term conservation of both local, cultural identities and the environment. They transport out and recycle all non-organic garbage and work with local suppliers whenever possible. Your visit will encourage the local communities to support responsible eco-tourism as a sustainable alternative for their living. Let Adventure Journeys show you the best of Ecuador! This was a wonderful trip and I was able to fill my bucket list on many activities. It was fun, with more activities than I could do in one day. Beautiful country and food. The people were very warm and inviting for our group. Wonderful time. We had an excellent guide, Daniel, from Adventure Journeys. The itinerary was exactly what I expected and very accommodating to my needs. We had a great time and would recommend to anyone. The trip was well organized and Christian is so experienced. We don't normally take extended organized tours, but this tour covered many of the things we wanted to see in a short amount of time, and it was well coordinated and super fun. We are looking forward to our next adventure with Adventure Journeys! Amazing experience! I grew emotionally, physically, and mentally. I miss Ecuador every day since I've been back! Daniel was amazing and went above and beyond to keep the group safe and inform us of everything. Excellent "greatest hits" tour of Ecuador with a caring, excellent, and efficient staff. Lots of contact and support with locals made for a homey feel. Christian was absolutely fantastic, whether as a guide or an activity director. Please note that each trip requires a minimum of two guests in order to confirm. Please wait to make travel arrangements until you receive confirmation from Adventure Journeys. What's the best way to get to Quito? Quito (UIO) is serviced by American Airlines, Copa, Delta, United, and Continental, with U.S. connections in Miami, Houston, and Atlanta. Yes! Your round-trip flights between the Galapagos Islands and Quito are included. You'll enjoy the convenience of traveling in small groups of 2-15 people. You should be in good general health for this trip. Most of the activities are fairly easy. However, on some days you'll be hiking over steep terrain or at a very high altitude, so you should be prepared for a challenge. It's a good idea to prepare for your trip with aerobic activities such as running, biking, or hiking at least 3-4 days per week, beginning three months or more before your departure. You'll be staying in first class and tourist class hotels both on the mainland and in the Galapagos, with the exception of one night of basic lodging with a local family in a magical place in the Amazon. If you are traveling solo, you may opt to have your own room by paying a single supplement fee, otherwise you may be paired with another solo traveler of the same gender. The single supplement is available for $570 and can be arranged directly with Adventure Journeys after you purchase your trip. This is optional and only necessary to pay if you want to guarantee your own room. Weather and temperature can vary greatly during the tour, as you'll experience a wide range of climates and elevations. Daytime highs during the summer can range upwards of 90 degrees F in the rainforest and the Galapagos, but cool off considerably in the cloud forest and at high altitudes. It's a good idea to prepare for both hot and moderately cold weather, as well as the possibility of rain showers. The package includes nine breakfasts (which consist of coffee, milk, tea, juice, eggs, and bread), four boxed lunches (consisting of sandwiches, snacks, fruit, water and juice), and one traditional lunch and dinner with the family in the Amazon. Some meals are not included to give you flexibility about where to eat and whom to spend your meals with. Your guide will be happy to recommend the best places to eat and make suggestions for local cuisine. If you have any food allergies or dietary restrictions, please inform Adventure Journeys when you book the tour so they can make the proper arrangements. The trip fee covers most of your costs. However, you should allot at least $7 per meal for meals not included in the itinerary, as well as additional money for alcohol, souvenirs, guide tips, and other personal expenses. Yes. Any luggage weighing over 44 lbs will incur an added fee. You're welcome to leave extra luggage in the hotel in Quito. You can also do laundry in the Galapagos for a minimal cost. The Ministry of Tourism of Ecuador has issued a new law regarding all visitors to Ecuador and the Galapagos Islands. An Ecuador Health Insurance Requirement is compulsory for the length of stay in the country. This is compulsory for all foreigners entering Ecuador and the Galapagos as tourists.